With the Conqueror’s Blade beta due to begin tomorrow on PC, we took the occasion to set up another giveaway for 100 codes. Be quick, as they’re probably going out really fast. As a reminder, to redeem your code you will need to set up an account on the official website and then log in. We’ve also interviewed Booming Games CEO XI Wang on the game to learn more about this ambitious MMO War Game that blends strategy and action in a manner we’ve not seen since the likes of Blueside’s Kingdom Under Fire. Enjoy! You’ve previously worked at Bungie on games like Halo and Destiny. What did you bring from those experiences into this new project? Both Halo and Destiny are great games, and we learned a lot while working on them, especially about how important the community around the game is. We hope to build a good relationship with our community. How many developers do you currently have at Booming Games? Currently, we have about 100 people, and we’re still growing. Did you decide on the business model yet? Will the game be available on Steam? The business model is not determined yet, we probably would consider a low premium + in-game purchase as our business model. Yes, we plan to be available on Steam but we’re not sure of the launch date yet. Is it fair to say that the game was inspired by the likes of Kingdom Under Fire with its mix of action combat and real-time strategy? Do you have any other influences worth mentioning? In fact, we took inspiration from many games like Age of Empires, Total War, Dynasty Warriors, Mount and Blade. However, what we’re trying to do with Conqueror’s Blade is to deliver a new gaming experience of a massively multiplayer online war game. We want players to conquer the territory in this big world. How big is the game world? Is moving between areas seamless (without loading screens)? It’s really big, more than 5,000 sq km. Moving between areas is seamless most of the time, with loading only occurring when you go through the “Pass”. Do you consider Conqueror’s Blade to be an MMO (Massively Multiplayer Online) game? 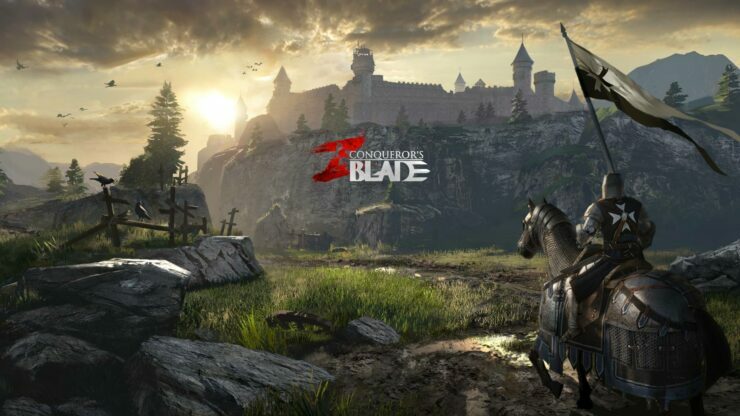 It’s an MMO war game, but instead of an RPG, we hope Conqueror’s Blade will be a Massive Multiplayer Online War Game – we are defining a brand-new game genre here. To what extent will the day/night cycle and weather system affect gameplay, for example with decreased visibility for AI NPCs? Yes. For example, when it’s raining, Musketeers are highly likely to experience misfiring; When the weather is foggy or there’s a sandstorm, the NPC’s vision will be decreased. In short, we want to build an immersive war world. What kind of RPG elements are in Conqueror’s Blade, if any? Conqueror’s Blade is not an RPG. The longer players spend in game, they will acquire more powerful weaponry and equipment, which are all designed to follow the real-life counterparts. And different types of weapons offer their own advantages. Will there be any PvE group dungeons/raids at all? We have some PVE, but we want to focus on PVP at this time. We expect to add more PVE in the near future. How many civilizations will be available at launch? Do you plan to add more after launch and if so, will these additions be paid or free DLC (downloadable content)? There will be more than 3 civilizations available in the Beta Test, and more will come for sure. Currently, we haven’t decided yet the form of game additions. Could you explain in detail how the Clan versus Clan struggle for territories will work in the game? It is a complicated but fun design. We don’t define any boundaries between countries, so players must face challenges in the game world where they need to strive to survive. There will be many strategic spaces, which we think is the most interesting part of the game. What are the recommended system requirements to play Conqueror’s Blade? Can you talk about the features of your custom made CHAOS engine? Will it support DirectX 12 and/or Vulkan APIs? The CHAOS engine excels at performing dynamic world effects, for example hit reactions, destruction, animations, etc., and it is also good at efficiently simulating and rendering massive numbers of characters and scenes on a vast scale, which is a critical feature for immersive war experience. It supports DX11 currently. We know you’ve implemented some NVIDIA GameWorks features into the game. Can you detail those for us? Yes, we have implemented some NVIDIA GameWorks features, such as Ansel and HBAO+. Do you plan to have controller support on PC? Yes, we plan to include controller support, which will be optimized for the next beta stage. An article posted by 2P.com a few months ago mentioned that War Rage (the game’s previous title), would also launch on PlayStation 4 console. Is that still in your plans and if so, do you have any timeframe for this release? Are you considering whether to release Conqueror’s Blade on Microsoft’s Xbox One console, too? We are excited about bringing the game to console, but it is too soon to begin talking about details. How long do you expect the beta phase to last? Do you have an estimate on the date of the game’s full release? The initial beta test will last for 1 week. It’s the first global connection test and we’re testing server stability, which is why it’s is so limited in time and players. We’ll have additional tests afterward, and the full release is scheduled for this year.